Colombia’s conservative opposition took to the street on Saturday to voice broadly supported discontent over President Juan Manuel Santos and ongoing peace talks with leftist rebel groups. The peaceful protest, organized by former President Alvaro Uribe, was held less than a month after labor unions, and rural organization of miners and farmers took to the street for a 24-hour national strike. But while the strike, held on a weekday, had mainly mobilized rural Colombians and leftist activists, Saturday’s march was largely attended by urban Colombians, who in significantly bigger numbers showed up. 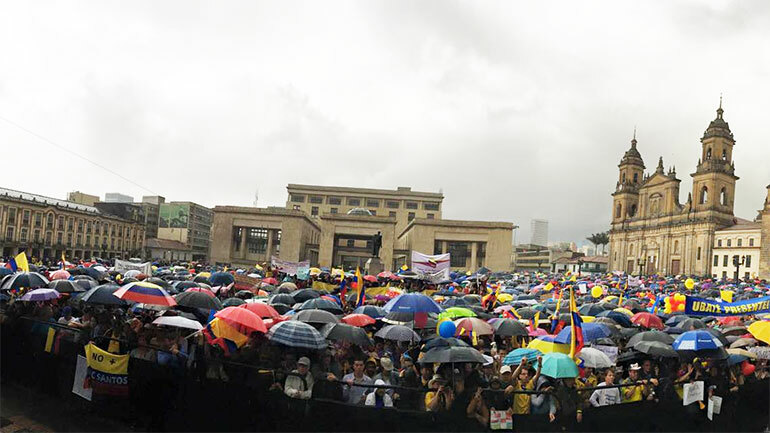 In Bogota, an estimated 20,000 protesters easily filled the main Bolivar Square in spite of rainy weather. In Medellin, Uribe’s home turf, many thousands of protesters filled up the main Oriental Avenue on their way to the government district. In other cities, significantly smaller protests were held. No irregularities were reported in any of the protests. The protests made it clear that Uribe can still count on the support of a significant and vocal minority of Colombians in spite of having been politically isolated in Congress and abroad because of his resistance to peace talks, and a series of corruption and human rights scandals. In the meantime, the two anti-government protests also showed how divided the opposition against the unpopular centrist president is. While the rural and leftist strikers were in explicit support of the peace talks with the FARC and the ELN, those who marched on Saturday were largely in opposition to those talks.